True Gold : Chapter II reanimates the photographs of mass demonstration events. Le Quy Tong's images are sourced from historical archives and mass media, stripped of their original contexts and redrawn as unexpected experiments. To understand bygone events is to open them up for flexible renegotiations. Le Quy Tong’s solo show, “True Gold: Chapter II”, approaches this open-endedness as a feasible means of remembering and moving forward. 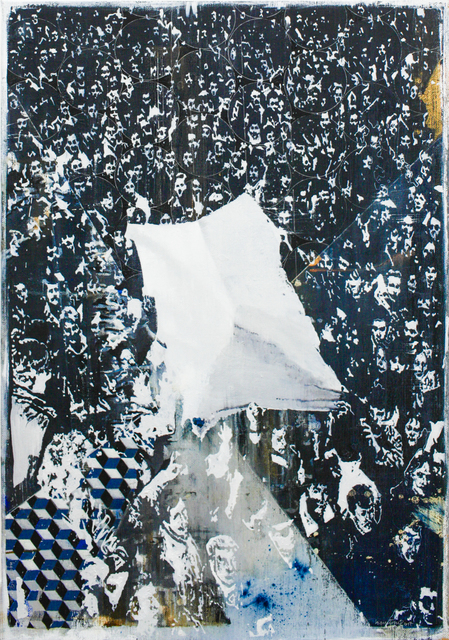 His altered images of protest, revolution, rubble and revolt are a way of combating forgetfulness, of prolonging history and highlighting its malleability. For Le, these reminders constitute an absence of certainty and amplify an eternal openness – inviting viewers to reinterpret the past without restraint. The exhibition, thus, does not attempt to re-present specific events, but rather to affirm their permanent, if remodelled, place in history and must be approached, as the theorist Maurice Blanchot puts it, as “the effacement of lines that cannot have been drawn if not by the stroke that now deletes them”. In this vein, Le asks: is it useful, or even possible, to pluck specific moments from the past, reconsider them in the present and offer them up for articulation in the future? 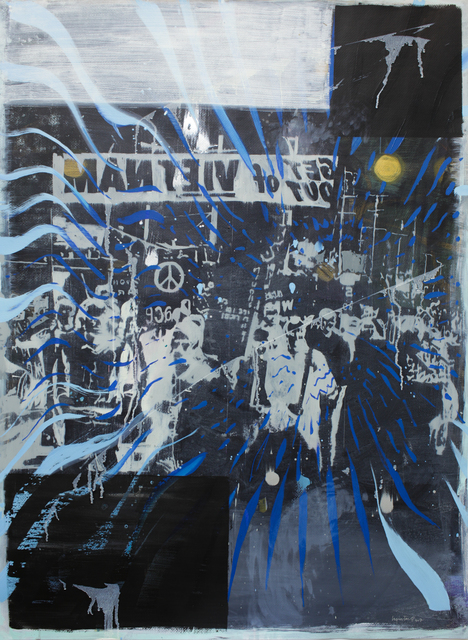 Stemming from his previous series, True Blue – Tong’s first foray into conceptual hybrid painting after a lengthy career break – True Gold reanimates the photographs of revolutionary events. Now in its second chapter, Le’s images are sourced from historical archives and mass media, stripped of their original contexts and appropriated, dissected and redrawn as new, unexpected experiments. He meticulously integrates grids and geometric shapes, overlays golden pigment and obliterates signifying identities. Le explains, “I would like to emphasize that imposing ideology on human beings is to destroy the capacity for freedom of thought and understanding. It is turning people into servants of ideology”. Deliberately obscured and still maintaining an air of True Blue’s sombre tone, it becomes the task of the viewer to decipher between the invented and the genuine, the alternative and evidential. The artist reminds us that an image’s function in the media only constitutes its first (of many) roles in a fragmented lifespan; there are more iterations, or performances, through which each photograph operates, assuming vastly different identities along this route. There is, however, a unifying theme. 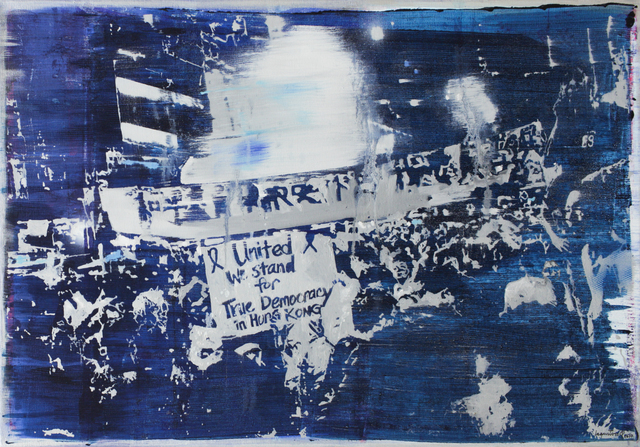 Amongst the works selected for “True Gold: Chapter II", several deal with both active and linguistic protest – shown in signs that scream “United We Stand For True Democracy in Hong Kong!”, “Bersih”, “Get out of Vietnam!” from the anti-Vietnam war demonstrations in Washington DC - and despite the presence of peace signs and muted colours, the canvases are loud, boisterous and busy. As such, text plays an undeniably central role, not only because it places the canvases in specific histories, but because it activates their current associations. The piece, No. 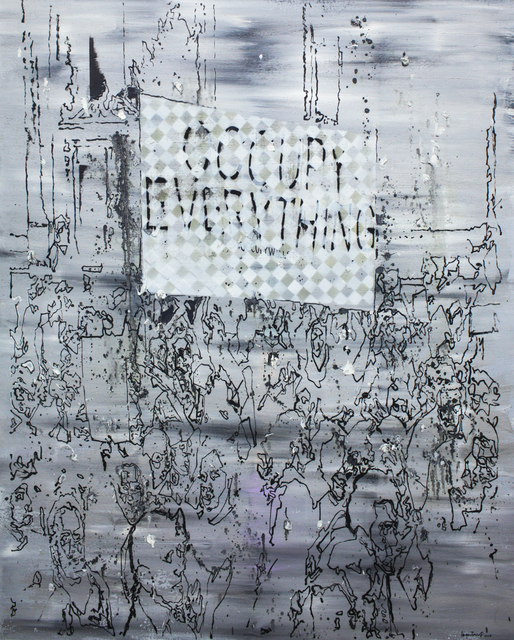 4, reads “Occupy Everything”, the monochromatic palette is animated by the depiction of a hectic, wiry scene. Perhaps a nod to the Occupy movement circling the globe in 2011, No. 4 depicts not one protest, but the perpetual state of protest. We can still hear their shouts. The words ‘freedom’ and ‘peace’ also emanate throughout the exhibition, encouraging us to define each term, and, in reference to the exhibitions’ title, to ponder their worth – their weight in gold. The show is rounded out with No. 8, which displays a mass demonstration in the Czech Republic. Viewers can hear the bustling streets and the protesters’ frenetic cries, but it is uncertain whether their gathering is part of the 1989 Velvet Revolution or in reference to President Milos Zeman’s recent media critique. This obfuscation is intentional; while it appears that the protesters carry the Czech flag, it has, for the most part, been whitewashed. Their nationality, occasion and cause, whilst momentarily crucial, are no longer part of the ambiguous event’s future recollection. Nonetheless, the piece emits a resilient echo, reminding us of history’s perpetual return. 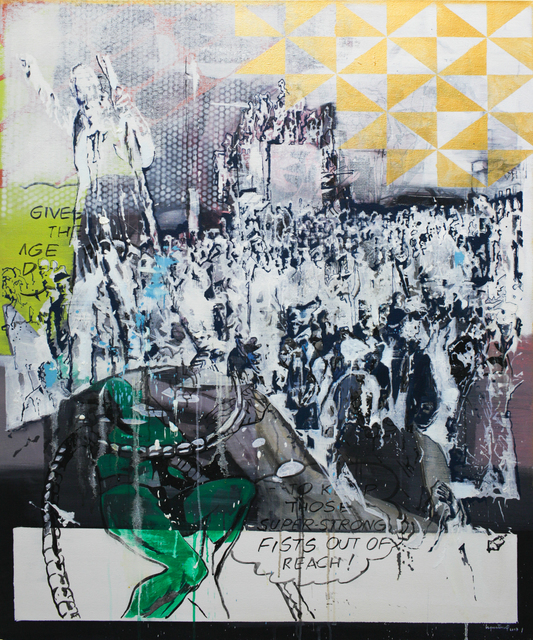 In discussing the second chapter of True Gold, Le equates his canvases to cover bands playing resurrected songs. While the original melody remains, the piece is given new character as it reverberates. He states, “I think this is a necessary action to repeat and reinvent and keep going. I like [how] the old songs are recovered and reworked into new versions. This repetitive action is similar to the way I am redrawing the photos”. Here the artist leaves us with nothing but questions: What happens when ‘old songs’ – those sung in the key of revolution – are used in a place and time other than where and when they were intended? How does this act of displacement modify memories of the original event and what effect does it have on those who witnessed or remember it? Resonating from moments which are quickly fading from the collective psyche, each of Le’s gilded images are impartial reminders of history, its luxuries, its struggles and its enduring call for reinvention. Born in 1977 in Hanoi, Le Quy Tong graduated from the Vietnam University of Fine Arts in 2000. In recent years, Tong has exhibited in an array of local and international institutions including the Vietnam National Museum of Fine Arts, the Goethe Institute (Hanoi, Vietnam) and Henri Martin Museum (Cahors, France). 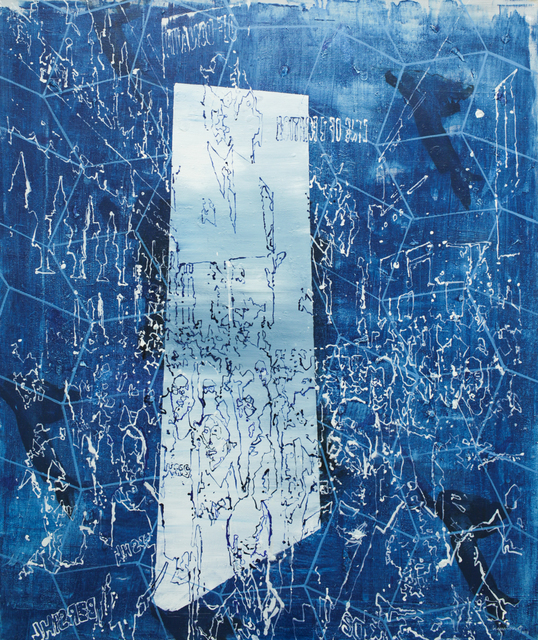 His works are part of the PostVidai, RMIT Hanoi and Bodnár Collections.